Los Angeles County Fire and Los Angeles City Fire worked on a small brush fire on Sept 29 named the Freeway Incident. This was located on the old road at SR-14, just North of the I-5 & SR-14 interchange. 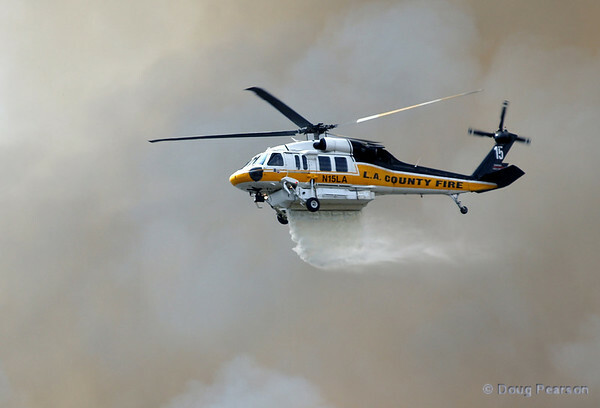 LA County Copter 15, LA Copter 18, LA City Fire 1, LA City Fire 6 and Erikson 738 participated. Copter 15 doing a water drop at the Sept 29 Freeway Incident, The Old road at SR-14, North of I-5 & SR-14 interchange.